Read more about Nikolas Motorsport history and see our special cars. David Nikolas founded Nikolas Motorsport in 1987 after spending over 15 years in the manufacturer dealership organizations of BMW, Mercedes, and Porsche. 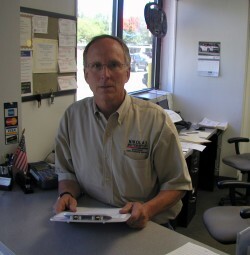 He has specialized in the service, repair and performance tuning of BMWs for over forty years. When the business was first started, David did the service write-ups, completed the work and did the bills. Today, you will typically see David assisting with diagnostics; road testing completed cars or assisting other technicians with problem vehicles. Additionally, David would typically complete engine or manual transmission rebuilds done at Nikolas Motorsport. He also has an extensive background in building, prepping and driving racecars. In addition to racing BMWs, David owns and races a March Can-Am car. He has recently completed the restoration of a Fabcar GTP car to run in vintage events. These cars are usually on display at the shop. If you would like to take a look, please stop by. In his spare time, David also enjoys spending time with his daughter Tracy. Since 1987, the business has grown to be a premier INDEPENDENT BMW-Porsche-MINI service operation. In 2004, Nikolas Motorsport moved to it’s new and present location at 2683 Orchard Lake Rd. Sylvan Lake, MI. Over the years, Nikolas Motorsport Independent BMW-Porsche-MINI Service has grown to be the dealership alternative in Southeast Michigan. Our mission is your overall satisfaction. Please give us a try, we think you’ll like us. If you have not been to our facility, please feel free to stop in and have a look. Even if your car does not need anything at the moment, we would love to see you and offer a tour. Our address is 2683 Orchard Lake Road, Sylvan Lake, MI 48320. The telephone number is 248-682-7755. We are located approximately 1 1/2 miles west of Telegraph Road, between Middlebelt and Cass Lake Road. A specific benefit of this location is the traffic light immediately in front of the building. This will enable you to easily and safely enter and exit in either direction on Orchard Lake Road at virtually any time of day.